World Plumbing Day 2019 was the biggest and best celebration of the day to date as the event continues to grow year on year. Between 12 February 2019 and 20 March 2019 there were 500+ tweets using the hashtag #WorldPlumbingDay, hundreds of Instagram and Facebook posts that reached an audience of thousands. On 11 March, the campaign culminated with a simple message; "It’s World Plumbing Day". That message alone reached over 70,000 people online. If you missed the campaign, you can find the resources here. The campaign contributed to significant growth in our social media following, with over 800 new followers over our varied social media channels. Of course, World Plumbing Day is not just about sharing messages online. It is about gathering with colleagues and engaging with your community about plumbing and all the benefits it provides. This year’s activities were extremely varied and saw award ceremonies, coloring competitions, community water ways were cleaned up, industry forums held, celebratory breakfast and lunch events, meetings, school presentations and skills contests. IWSH utilized the occasion to launch Community Plumbing Challenge for 2019. This year there will be two events, one in Nepal and another in the Navajo Mountain region in the USA. For more information on both and how to get involved visit the CPC facebook page. Inside this WPC News is a wrap of many of the events that took place around the globe on World Plumbing Day 2019. I would like to thank all the WPC members for making this World Plumbing Day the most successful so far and I look forward to what is in store for 2020. The plumbing world will be gathering for possibly its most important assembly ever, the 12th triennial World Plumbing Conference 2019 in Melbourne, Australia. September is a vibrant time in Melbourne. Spring will be arriving, the days will be lengthening and the Australian Rules Football (AFL) finals will be taking place (more on that here for the curious) - you will be able to feel the excitement in the air. It also means that Melbourne is extremely busy with hotels booked to the max, so I strongly recommend booking accommodation and flights now to avoid any disappointment. The second round of speakers for WPC 2019 will soon be announced. I am very excited about the excellent program of high-calibre speakers that will be presenting and I look forward to learning about where the industry is headed from this divers array of thought leaders. We will also soon be announcing our sponsors who are ensuring that we can run a truly wonderful event. So again, I urge you to get in early and make sure you are at this most important industry event. If you or your organisation is not already connected with the WPC via social media, make sure to do so today! The simple act of sharing one of these images helps to spread our message far and wide. Master Plumbers and Gasfitters Association of Western Australia held a very special World Plumbing Day event to launch the Better Life Outcomes initiative with WPC Chair, Shayne La Combre and special guest Sir Bob Geldof. The Better Life Outcomes initiative joins the dots between plumbing, sanitation, health, training and employment for indigenous Australians living in remote communities. The initiative will commence with pilot projects in communities in WA’s Kimberly region and in regional Victoria. The pilots will include an audit of current infrastructure and availability of maintenance services, followed by a full needs analysis, cost modeling and training. Master Plumbers Association of Queensland held a World Plumbing Day Industry Breakfast and announced their 2019 industry ambassadors. "With the wealth of industry experience and diversity of these three ambassadors, we are able to focus on the industry as a whole, both male and female, ensuring the longevity of our industry. The Ambassadors will focus on raising awareness to students about what’s involved with an apprenticeship and where the trade can take them both professionally and personally," – Ms Penny Cornah, Executive Director of Master Plumbers’ Association Queensland. At the Plumbing Industry Climate Action Centre, the annual Apprentice Skills Contest saw ten plumbing and five sprinkler-fitting apprentices compete for the chance to be named "Best Apprentice Plumber/Sprinkler Fitter." Contestants were given a specific work project and judged on precision, diligence, skilfulness and attitude. In Burkina Faso, a gathering was held by the Association of Plumbing Professionals (A.P.P) to celebrate the day and promote the importance of plumbing in creating better health outcomes. 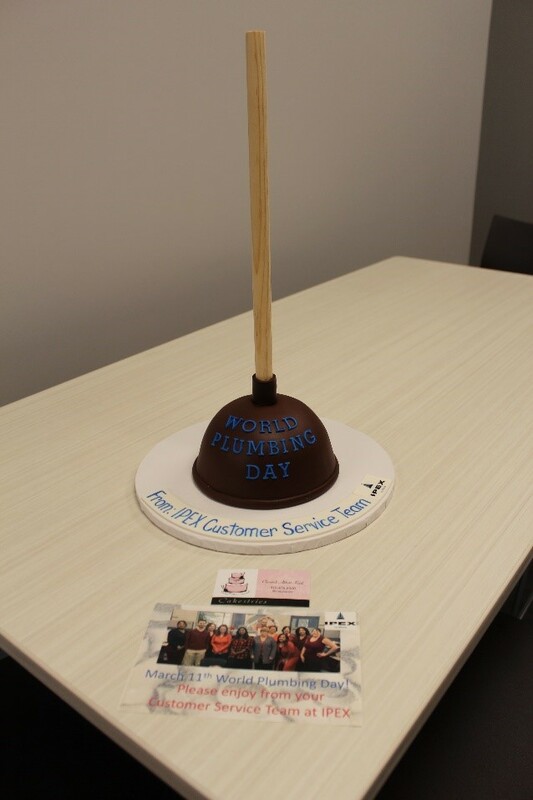 Once again, we had a successful year celebrating World Plumbing Day here in Canada. T-Shirts Sold and Money Raised – For the second year in a row CIPH members have worn t-shirts celebrating World Plumbing Day and used the sale of them to make a donation to WaterAid Canada. This activity expanded from one region to two in 2019. Creative Industry Engagement Acts – Cakes Ahoy! As an organization, CIPH also spearheaded a new initiative called What Water Means asking students to tell us what water means to them and donating $5 to WaterAid Canada for every submission. We received hundreds of submissions from coast to coast sighting hydration, health, sanitation and more. This was a successful effort to hear what our youngest stakeholders think about our most precious resource and CIPH made a $2000 donation to WaterAid as a result. World Plumbing Day was successfully held in Xiamen in China on March 11. The event, "2019 World Plumbing Day & China Building Water Forum" opened at the Wanda Realm Hotel with more than 250 plumbing experts participating in the event. Shayne La Combre, chair of the WPC was invited to officiate the world plumbing day event, which was held alongside the Plumbing Forum of Xiamen. Mr La Combre spoke about World Plumbing Day, the Four Pillars of Plumbing, and WPC 2019. It was well received by the installers and manufacturers as well as the local Government. Mass media such as XIAMEN DAILY, Tencent Video and Plumbing World covered the event. The conference widely publicized that Plumbing is important to public health and hygiene and green plumbing design was the main focus in the seminar with experts covering a wide spectrum of the industry in terms of water saving and sewage treatment. Ten speakers, including famous figures from social groups and enterprises of the plumbing industry addressed the audience and Mr Henry Hung, the former Vice Chairman of World Plumbing Council and past Chairman of Chartered Institute of Plumbing and Heating Engineering – Hong Kong Branch attended and took part in the meeting. 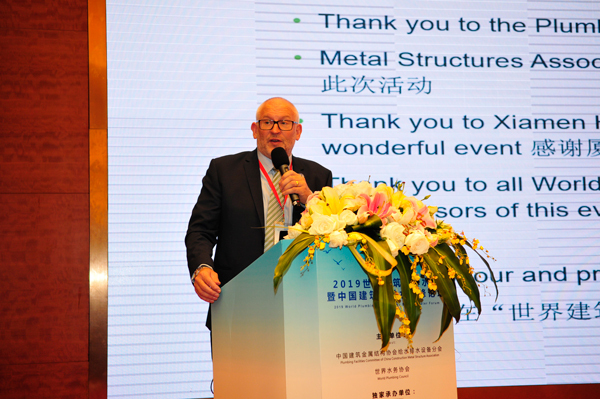 During the conference, Shayne La Combre, chairman of WPC also awarded to the organizer, Xiamen Haiyan Pump Industry Co., Ltd, which joined in World Plumbing Council and to be a new member. The event was hosted by Plumbing Facilities Committee of China Construction Metal Structure Association and organized by Xiamen Haiyan Pump Industry Co., Ltd with support from more than 20 members of the PFC. The Worshipful Company of Plumbers announced six bursary winners on World Plumbing Day. Each recipient received £1,000 of tool/equipment vouchers. 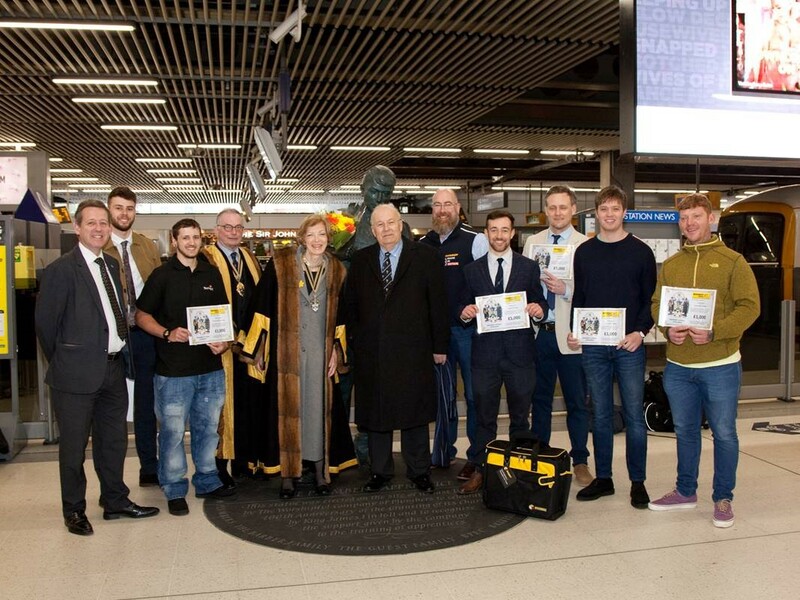 The presentation was at Cannon Street Station in London next to the Plumber’s apprentice statue. Separately to that, the Lord Mayor of London and Fiona Woolf of the Master Worshipful Company of Plumbers presented Master Plumber certificates to Lucy Mawer and Jamie Cousins. The Indian Plumbing Association (IPA) had over 500 participants in a number of activities held across the country on World Plumbing Day including technical seminars, painting competitions, poster competitions, training for women in plumbing, blood donation drives and the formation of a new Chapter in New Mumbai. The IPA chose the theme of ‘I Save Water’ for the day and it’s accompanying mission for the year is to save 100 Crores Litres (1 crore equals ten million) of water in a year. "HOW WE USE & CONSERVE IT", is of the utmost importance today. Ten years old Shweta brilliantly spoke about the one blessing on earth that is today in acute danger – WATER. 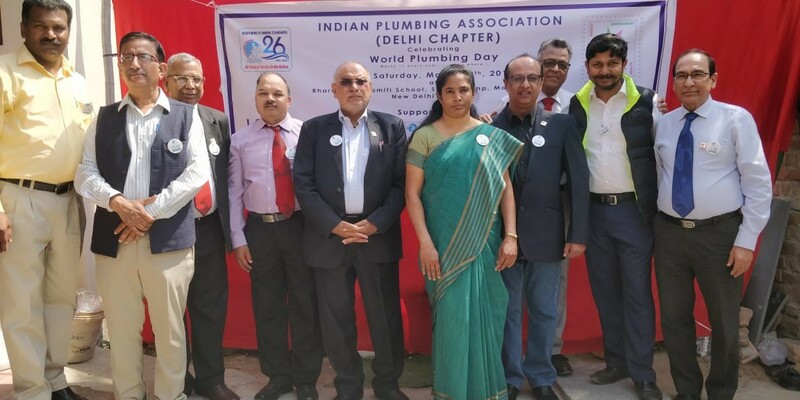 In honor of the date, Indian Plumbing Association - Delhi Chapter (IPADC) organized a very special morning filled with the laughter of children with a charity event at a school led by Bharat Seva Samiti (BSS) on 09th March 2019. BSS School located in Mandi village, New Delhi, works with under-privileged children from the weaker socio-economic sections of the society, primarily to educate them with means to a better future. Over 57 children from the age group of 3 to 13 years from the BSS participated in the WPD event, highlights of which included the recitation of the National Anthem, a drawing competition, skits and dances all put together and performed by the children. IPADC distributed note books, pencils, erasers, color pen sets and special food packs to all children. The children made beautiful paintings, depicting their ideas about conservation of water & protection of earth environment. There was also a prize distribution at the ceremony, with prizes given to competition winners and token gifts to all participants. IPADC also made a donation to BSS school to assist in improving the school's sanitation facilities. The IPA Kerala Chapter held a poster competition with "Plumber" as the theme at Jyothi Engineering College, Thrissur. They also facilitated the "I Save Water" campaign at SN Engineering College, Kochi and held a seminar on "Water Conservation Techniques and Technologies" at Hotel Le-Meridian Kochi. A ceremony was organized by the Association of Mastery of Solidarity Fez in partnership with the traditional industry room of Fez on the occasion of World Plumbing Day 2019. Held at the headquarters of the traditional manufacturers club in bṭḥạʾ on Monday, March 11, 2019 the celebration was opened by Mr Saeed Al-the, President of the assembly. During this festive ceremony, the framework for cooperatives and associations in the room was honoured as a recognition of the services and efforts they provide to the traditional industry. During the event, everyone present took part in the discussion and gifts were presented to honorees. The Rwandan Plumbers Organisation visited a public water tap in our town where we talked about the importance of plumbing in public health to people in the community. We wish all plumbers in world wide a joyful day and to keep in mind people who don't have access to plumbing systems. The Institute of Plumbing South Africa organised a community clean up of waterways such as beaches and rivers, truly getting into the spirit of World Plumbing Day! IAPMO EVP Gaby Davis served as “Teacher for the Day” for Mrs. Hess 6th grade science and social studies classes at Floyd M Stork Elementary School in Alta Loma, California, to teach students about the importance of plumbing to our health, the need to conserve water, and how others – those without plumbing – spend their day. Students were emotionally moved by the “Water Is Life: Community Plumbing Challenge, Navajo Nation” trailer, with one class applauding the work. In addition, several students were interested in how they can help the Navajo Nation and others around the world – even asking the youngest age of someone who can travel to work on a CPC project. There were many more events held all over that were captured on social media, see below for a snapshot of these and visit the World Plumbing Day page on the WPC website for more. 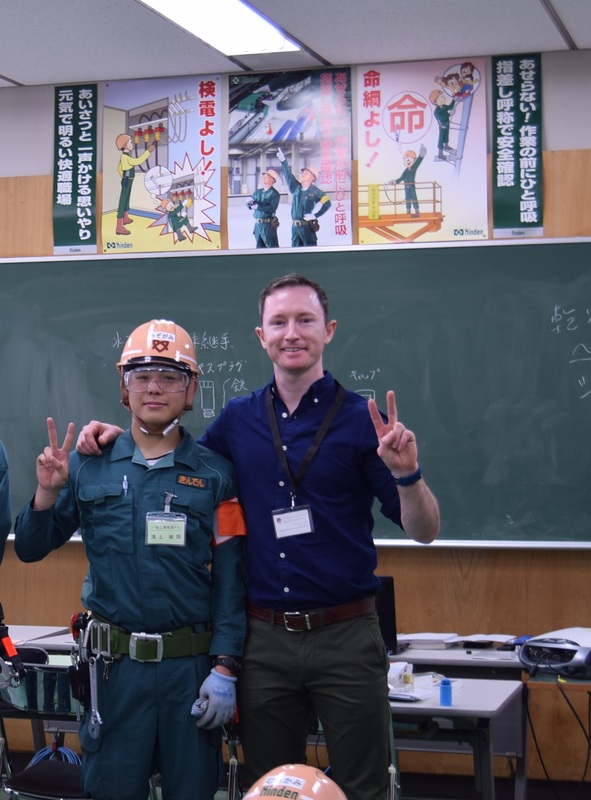 Shay Shanahan, a plumbing teacher from Ireland and the recipient of the WPC Education and Training Scholarship in 2017 undertook a study to compare the plumbing education & training in both Japan and Ireland in May 2018. During Shay’s visit to Japan he visited the Tokyo Metropolitan Flood Defence Centre, Nishihara Engineering Ltd, Kinden Corporation Training Centre, an Industry Vocational High School in Osaka, a WorldSkills demonstration, and spent a day in the life of a plumber in Kyoto. He also got chance to visit two plumbing material manufacturers. Shay said of his experience that it has been life changing. "The World Plumbing Council Scholarship has offered a way of seeing things differently which has been a catalyst for learning. The study provided me with data from observations and from experiences with others in the field which has enhanced my own teaching practice in Ireland. In addition, the World Plumbing Council Scholarship provided me with an opportunity to network and meet other plumbers and industry professionals from around the world. I was overwhelmed with the generosity we received from people we had never met. Japan has left fond memories in my heart. I really hope you enjoy the report." Now Recruiting: New international Trades Team to support next phase of DigDeep Navajo Water Project roll-out in Navajo Mountain, Arizona/Utah, USA.